Hello, Angie here from Bob Ward & Sons…BUTTE & BOZEMAN are gonna see some COLD weather this week, & some precip, but that won’t keep YOU folks off the water! If you’re over BOZEMAN-way, be sure to fish the GALLATIN thru the Valley & up the Canyon…just beware of some slushy or iced-up areas the farther up you head! Egg patterns, Worms or Brown Stones have had their share of success in the past week, so stick to ’em, & place them deep. Watch carefully for Midges swarming on the surface, there should be some of this activity! The UPPER MADISON is productive when you are out of the winds, & here’s where you want to work your Streamer patterns, JJ Specials, Bow River Buggers, Black Sculpins or anything you got in an Olive color! Set your Nymph rigs down as far as you can get em, drive a Mega Pheasant Tail under an indicator with some lead on! The LOWER MADISON has suffered some visibility issues lately with Ennis Lake turning due to seasonal windiness, but the folks fishing Bear Trap have seen some good times with worms trailing Egg Patterns…look for any pods that might be watching the surface for bugs…Midges should be showing soon, if not already there! The YELLOWSTONE is plenty low, sometimes windy, but mostly fishing quite well this week, so get out your Stoneflies, & trail a bug small & light in color behind…get your Olive, Grey or Black Streamers in the water, too…can’t go wrong with a Silvery’s Black Sculpin, a Black & Olive Flash Fry or an Olive Home Invader stripped slowly in the pools! 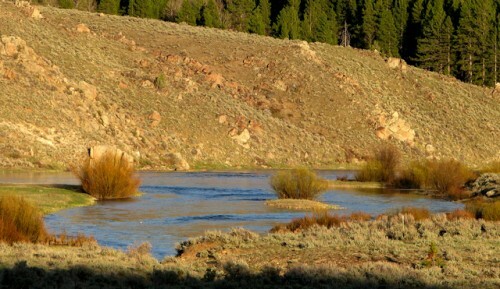 If you’re hanging out over BUTTE way, the BIG HOLE RIVER is LOW but wadeable, & we still hear the Divide Canyon area is fishing especially well! Go smaller on your Streamers, sz 6-8 as an average, & the color spectrum should be in the white or yellow range…Yellow Home Invaders, Brown/Yellow Flash Fry, Tan Bellyache Minnow, all these are producing BIG! The BEAVERHEAD is providing good opportunity for any kind of angler…Midges have been spotted for the dry fly guys, but of course Nymphing is going to be significantly more productive about now, with Eggs & Worms being excellent go-tos…I’d skip the JEFFERSON this week. It’s got clarity issues, & is just too windy & muddy for most tastes! You might try your favorite gold or silver spinner to emulate sun sparkle in the clear afternoons! The Trout are out, and responding, say our Butte Store anglers! Ready to put together YOUR list for Santa? We’ve got the best new stuff you’re wanting in store, from new reels & waders to techy-warm clothing, gloves, & ice fishing accessories galore…come on in & see! Pick up the gifts EVERY sports enthusiast wants from Bob Wards, & don’t forget to stay tuned to hear what I have for you next week, friends & neighbors!